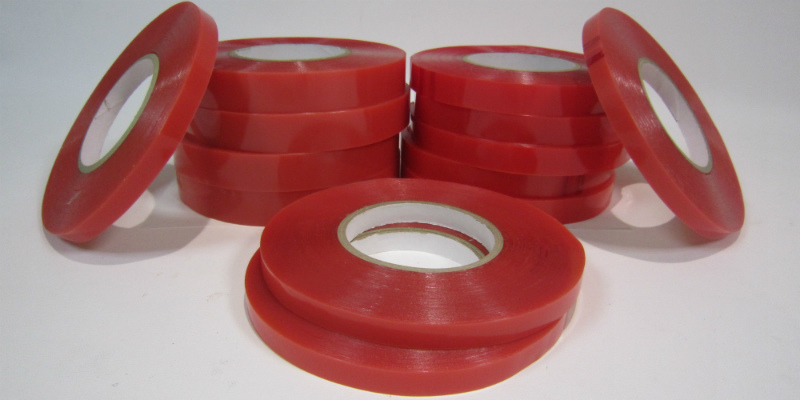 A high clarity clear double sided tape, .22mm thick coated with solvent acrylic adhesive and a red OPP die cuttable release liner. This tape features excellent adhesion and holding force to a wide variety of surfaces. Excellent initial tack and high sheer adhesion. It displays excellent UV, weather and temperature tolerance. This double sided tape also exhibits a high resistance to plasticiser and features moisture stability and chemical resistance. Ideally suited to a wide variety of industries which include but are not limited to: Curtains and Blinds, Trim Mounting, Acrylic Bonding, Signage and Display and Extruded plastic profiles. Log rolls 1220mm wide. Can be slit to any width required. Please call for details.